L'ÉCOLE DES MARIS. COMÉDIE was written and originally performed by Moliere in 1661. As stated in its introduction: "The School for Husbands was the first play in the title of which the word 'School' was employed, to imply that, over and above the intention of amusing, the author designed to convey a special lesson to his hearers. Perhaps Molière wished not only that the general public should be prepared to find instructions and warnings for married men, but also that they who were wont to regard the theatre as injurious, or at best trivial, should know that he professed to educate, as well as to entertain. We must count the adoption of similar titles by Sheridan and others amongst the tributes, by imitation, to Molière's genius." This comedy was a great success when it debuted in June, 1661 in Paris. 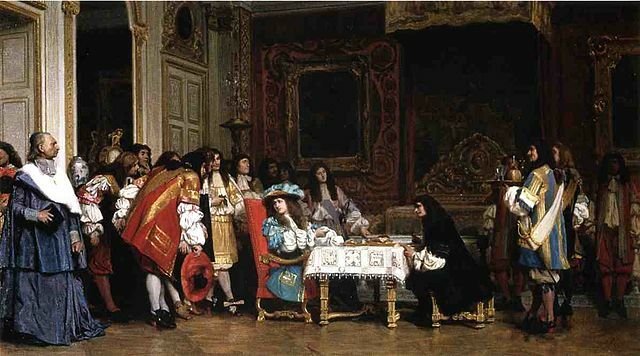 The following month, Moliere "schooled" the whole court with its production, including the brother of the King, and the Queen of England; apparently, they approved. Moliere's most popular play was Tartuffe; or, the Hypocrite (1664), often studied in high school grades 11-12.